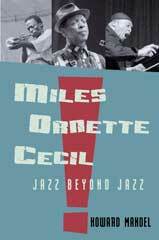 Continue reading Jazz Beyond Jazz. I'm a Chicago-born and New York-based writer, editor, author, arts producer for National Public Radio -- for more than 30 years, a freelance arts journalist working on newspapers, magazines and websites, appearing on tv and radio, teaching at New York University and elsewhere. I'm president of the Jazz Journalists Association. Miles Davis intended On The Corner to be a personal statement, an esthetic breakthrough and a social provocation upon its release in fall of 1972. He could hardly have been more successful: the album was all that, though it has taken decades for its full impact to be understood. Over the course of three decades, I've been privileged to get behind the scenes and meet heroic creators of jazz as well as up-and-comers, innovators and exemplars of many other genres. Please enjoy these archival interviews and articles.